The Blue Cut Fire is contained and roads are open; however, many don’t realize that while the fire may be over, the recovery process is just beginning for many affected by the blaze. The massive Blue Cut Fire burned over 37,000 acres in a matter of a few short days. Red Cross shelters provided immediate disaster relief and refuge for hundreds evacuated. Now, the next stage of relief begins. As families return to search for mementos not consumed by the fire, Red Cross Emergency Response Vehicles (ERVs) will begin moving through the devastated neighborhoods offering water, snacks, meals, and clean up supplies. The daily operation begins at the bulk distribution point established in Victorville. Each morning, a team of three Red Cross volunteers line up with their ERVs, which are then loaded with supplies to be taken to fire-damaged areas. Some of the ERVs are accompanied by a larger truck loaded with emergency meals known as “Heater Meals.” These meals have a long shelf life, and cook themselves when the cooking pouch is activated—helpful for those who live in areas where power is out and food has been spoiled. These heater meals provide a warm meal to the family without the need for them to leave their property. In addition to providing meals and snacks to fire victims, volunteers on the ground become the eyes and ears of the Red Cross planning team. Crews on the ground bring back information they receive about areas that previously may have been unreachable. They also provide assessment of damage in affected areas. This information is gathered at the end of each day and helps the disaster team plan for the next day of activities. During the course of the day, volunteers on the ERV will provide not only nourishment and hydration to those who have returned home, they will provide information on available resources available from the Red Cross and other agencies. Volunteers act as an information resource to those interested in receiving recovery assistance. Perhaps most importantly, volunteers provide a listening ear and a warm hug to residents as they sift through what was once their home and begin the recovery process. Interested in becoming a volunteer? 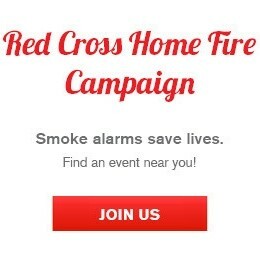 Visit redcross.org/volunteer to see the many opportunities near you.